I am in the first year of my PhD in dress history, and since I started in October I have also worked one day a week at Edinburgh Museums and Galleries: the council run group of museums which includes the People’s Story, the Museum of Edinburgh, the Museum of Childhood and a number of other venues around Edinburgh. My research is very much focused on museum collections, exhibition practices and engagement with objects, so it feels important to connect with an institution and understand more about how collections are managed. I also have a lot of fun uncovering hidden gems in the collections, trying to grapple narrow spiral staircases while carrying costume boxes, and spending a day out in the world as opposed to alone in my office! My PhD research is focused on women’s fashion from the First World War period, but more specifically, at how the ‘intangible histories’ of garments can be used to explore often-overlooked narratives from history. By ‘intangible history’ I mean the stories carried by objects – the emotions, concerns and hopes of a generation – and the context in which they were created, used and engaged with. I am interested in how these objects can be displayed in a more emotive, more engaging way within museums – so that both the tangible and the intangible elements of the object are used to best affect. At the moment I have been mostly focused on theory, but have already found a couple of great garments in the museum collections, and I am looking forward to getting started on more object based research. At Edinburgh museums I work with one of the History Team curators, Vicky Garrington, who has set us the challenge of locating all 95 pieces of a costume donation that came to the museum in 1977, but has become muddled within the wider collection. 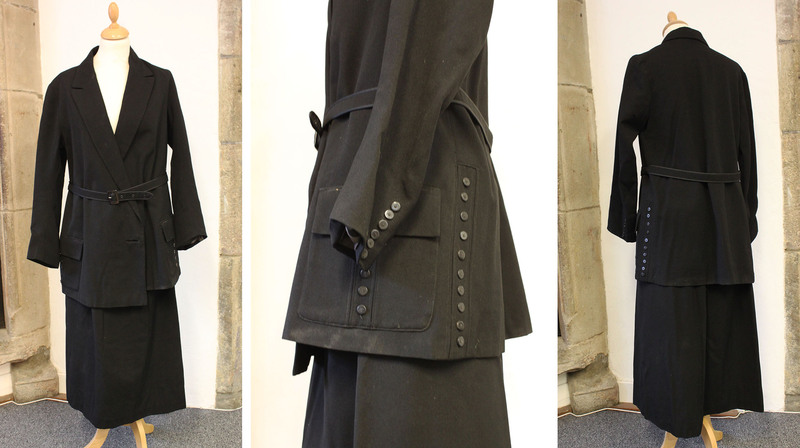 We are locating, documenting, photographing and re-packing each garment, so that the collection is more accessible both in the store and online: it will be made into an online exhibition on the council’s Capital Collections website. 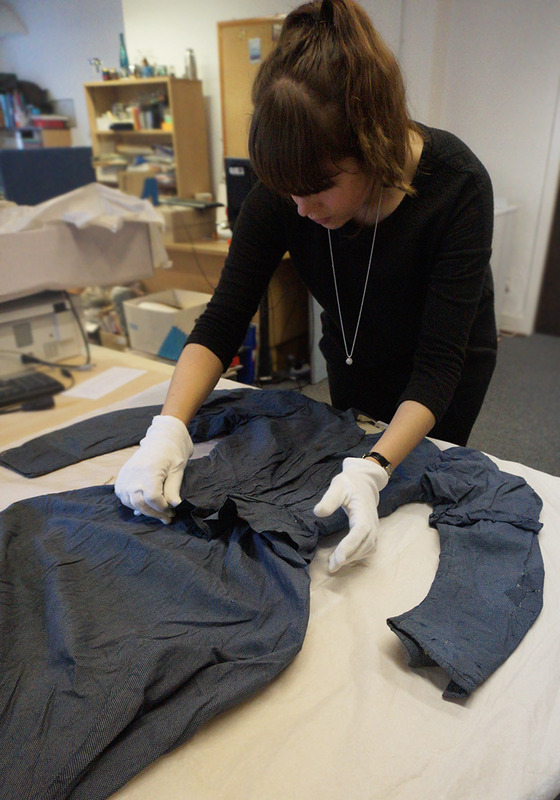 In my first few weeks at the museum I also found myself – to my great surprise – undertaking some conservation work. Dipping in and out of the Centre for Textile Conservation as I do I am constantly awed by the careful, precise work carried out by the conservation staff and students, but I didn’t think I’d be having a go anytime soon. Working with Collections Care Officer Paul McAuley, I helped clean and polish some military belts from the Earl Haig collection, and then made some custom mounts from plastazote. This was such a great experience and I learned some new skills that I hope I will get to use again sometime soon. Alongside these tasks, Vicky and I have been working on a project that relates specifically to my own research. If we receive the funding that we are applying for, I will be able to carry out some of my theories in practice, and the museum will hopefully gain some new visitors. I feel so lucky to have built up this partnership with the museum right from the beginning of my PhD. Every week I am grateful for the change of scene, the satisfaction of practical work, and the new skills learnt. But more and more I feel that my museum work is an integral part of the PhD itself, both in terms of understanding museum practice, but more significantly in the constant proximity to wonderful objects. Pictured is my favourite find from the costume collection: a ladies military-inspired suit from 1915, found a few weeks ago, and soon to take a starring role in a chapter of my thesis!